Susan Preston continues her tale about Simon’s business adventures, family, and faith in No Evil Shall Befall You. This novella follows After the Thirty Days, but can stand alone. Simon is seeing the effects of rearing a family in Egypt and the dangers of going against the law of Moses. It commanded the Jewish people to refrain from marrying and giving their sons and daughters in marriage to a person of a different religion. The old Egyptian cult, Wadjet, has infiltrated itself into everything Simon holds dear. 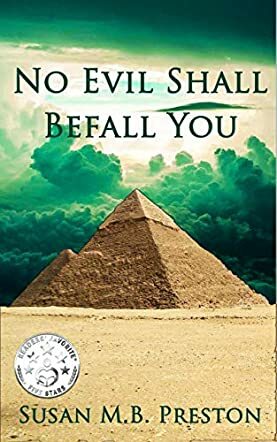 He is not about to let this evil dominate his life, the lives of his children and grandchildren as it struggles to gain control of the papyrus production. The ancient form of paper produced from the papyrus plant was important to the Jews and the Wadjets, placing it at the center of this story. I found No Evil Shall Befall You rich in culture and traditions. Susan Preston does well in presenting this historical story of a family business that makes papyrus. The major trials they faced to product and ship this paper were crocodiles and poorly maintained ports. This novella is for the adventurous at heart, knowing the plot and characters could change direction at a whim. Gradually the characters develop, letting the story unfold along with the evil scheme Simon’s son and wife had planned. I found the ending fascinating as Simon’s faith in God appeared to protect him. The author compels her readers to grab the next book in this series, Clash of Faiths, making this a series where you will eagerly await the next book.